Last week was a big news week for the UK’s small to medium-size cruise ships, with announcements that both Voyages of Discovery and Noble Caledonia would be doubling up their single-ship fleets, while Saga’s introduction of a new flagship will see its smallest ship returning to the German market. Meanwhile, Voyages of Discovery’s sister line Swan Hellenic has announced plans for a major refurbishment of its Minerva, which will receive more balcony cabins, a forward-facing observation lounge and a new walk-around promenade one deck up from the new balcony cabins. Elsewhere, Voyages to Antiquity will be going year-round rather than seasonal in 2012/13 by adding winter itineraries to its program of summer Mediterranean cruises. And lastly, Royal Caribbean has done an about face on credits for the 130 passengers it left behind last month in San Juan because of Hurricane Irene. Last week was a news week for small to medium-size ships in the UK. Not only is Voyages of Discovery doubling from one ship to two but so is Noble Caledonia, while Saga’s plan to welcome the Saga Sapphire next April will see its smallest ship, the Spirit of Adventure, leave its adventure fleet, to be replaced by the Quest for Adventure, now Saga Ruby II. The Spirit of Adventure will then return to Germany, from whence she came. 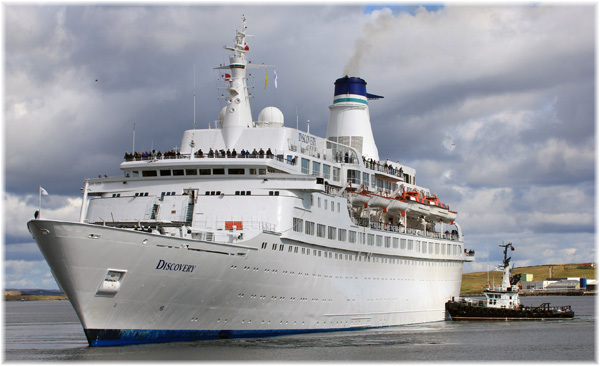 Voyages of Discovery has announced that the 550-passenger Voyager will be joining its 710-berth Discovery in November 2012 to give the brand two ships and an opportunity to expand its itineraries. Formerly sailing as Phoenix Reisen’s Alexander von Humboldt, the Voyager has been owned by parent company All Leisure since 2009 and operating out on charter. She was extensively upgraded earlier this year with the £23 million addition of more balconies, bringing her balcony count to thirty, along with other work in her public areas. Both the Voyager and Discovery will offer more flexible, less formal dining options, aimed at attracting a younger market of 45 to 55 year olds as well as bringing a new experience to existing customers. Voyager will offer open seating dining in three restaurants. Passengers will also be able to relax in comfortable lounges, enjoy a drink in the sumptuous Harry’s Bar or in the sunshine on deck at the Lido Bar, or read a good book from the well-stocked library. The slightly larger Discovery will not be forgotten in these plans. When the Voyager visits South America, she will undergo extensive upgrades during an extended dry-docking. This will include complete refurbishment of some of her teak decking, public areas and cabins, plus the development of other dining areas. Almost simultaneously with these announcements, London-based Noble Caledonia revealed the addition of a sister vessel to its 116-berth Island Sky with the acquisition of the former Hebridean Spirit. To be renamed Caledonian Sky, this 114-berth vessel was built as the Renaissance VI, and was a sister ship of the Renaissance VIII, now Island Sky. While with Hebridean, the Caledonian Sky received an extra lounge on her top deck but the two ships remain very close sisters. 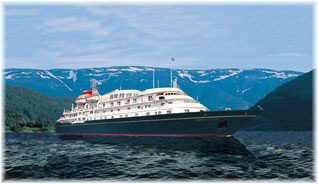 Noble Caledonia will take delivery of the Caledonian Sky in May 2012. Although she will initially work in the Atlantic, she will soon be bound for South America, Australasia and the Pacific and will essentially become the company’s Pacific ship in 2013. Finally, over at Saga, it was learned that the 350-passenger Spirit of Adventure will be returning to Germany, where she will go to work for Munich-based FTI Touristik as the FTI Berlin, based from April 2012 in the Mediterranean. 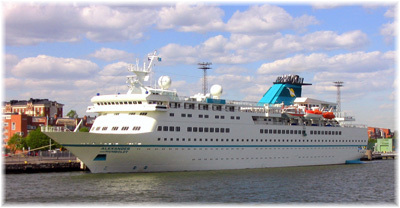 She will revive her original name of Berlin, under which she operated for Peter Deilmann for many years. In those years she was well known in Germany because the television show Das Traumschiff was filmed on board. FTI was originally known as Frosch Touristik and is Germany’s fifth largest tour operator, at one time having been part of Airtours. When the 445-berth Quest for Adventure replaces Spirit of Adventure in Saga’s adventure division, the 706-berth Saga Sapphire, built as Hapag-Lloyd Cruises’ last Europa in 1982, and now operating as Bleu de France, will take over as Saga’s new flagship, while the British-built 655-berth Saga Ruby, the original Vistafjord, will maintain the Saga Cruises brand at two ships. Over at Voyage of Discovery’s sister brand Swan Hellenic, the 350-berth Minerva will undergo a multi-million pound dry-docking from November 2011 to March 2012. More than £10 million will be spent on her, and her lease has been extended by eight years, to 2021. The refurbishment will include the removal of six cabins to free up extra space, giving the ship a total of 181 cabins. Of these, 32 will have balconies added, bringing the balcony count to 44. All cabins will be upgraded with new bathrooms. Public areas will also be much improved with the addition of a new forward observation lounge, the Orpheus Lounge, an expanded Shackleton’s Bar, a new internet lounge and a full walk-around promenade deck on the level above the new balcony cabins. The new specification will give the ship 23% balcony suites. On March 2, 2012, the Minerva will re-enter service on Swan Hellenic’s all-inclusive discovery cruises, which include a signature shore excursion program, all gratuities, port charges, and a program of talks from eminent guest speakers. 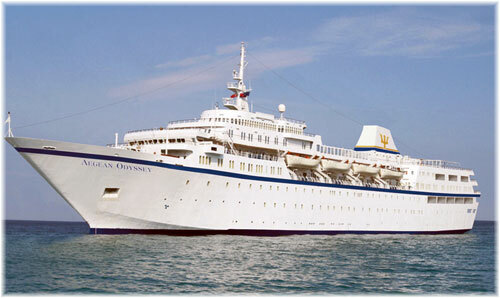 Voyages to Antiquity has recently announced that it will go year-round in 2012/13 with the addition of Far East itineraries to the Mediterranean cruises already offered by its 378-berth Aegean Odyssey. The new programme begins in November 2012 with a cruise from Mumbai to Colombo, and then continues to Singapore, Rangoon, Ho Chi Minh City, Ha Long Bay and Hong Kong. From there, it’s on to Bali and other ports in Indonesia before returning to Delhi in March 2013. Voyages to Antiquity fares include shore excursions in every port, gratuities, and complimentary wine, beer and soft drinks with dinner. The ship will go empty to the Far East and will not carry passengers on her transit through the Suez Canal and the Gulf of Aden. Royal Caribbean International has agreed to compensate passengers left stranded in San Juan, Puerto Rico, on August 22 after the Serenade of the Seas was forced to depart early to avoid Hurricane Irene.